I meant to actually draw something and post it, maybe along with the video of my drawing it. Completely ran out of time due to real world commitments. Note the variety of elements. I, the Renaissance Ninja, sitting at my computer writing, a Star Trek delta on the side of the desk. Above me, a picture of the rest of the ninja family. In the background, a saxophone and a telescope. 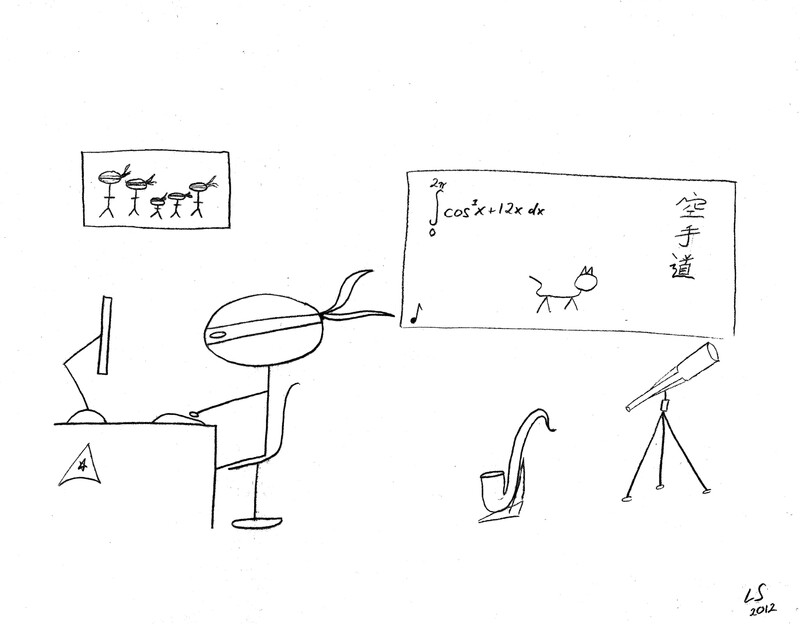 On the wall, a whiteboard with a simple integral, the kanji for “karate do”, a cat, and a musical note. If I were to draw this today, there might be a dog lurking somewhere, too. Note the straightness of the various straight lines and the curves of the various curved one. Note the wonderful expression of light and shadow and the bold pen strokes to create a pleasing mix of images. Note the effective use of whitespace so everything doesn’t look crowded together. Note that I can’t draw worth a damn, but I still do once in a while. Did anyone else draw something yesterday? Always lots going on, as it should be.